This tour will have you cycling Southern Spain’s finest countryside, integrating beautiful National Parks, remote white villages, and rides along the beaches of the Costa de la Luz (Coast of Light). From Bandit hideaways to Pirate coves and the site of the Battle of Trafalgar - this is an exciting part of the world still very undiscovered - offering one of the finest blends of cycling in all of Europe.Charming hotels and tasty authentic food en route add to the experience. Riding is a combination of quiet back roads and stunning parkways. Andalusia is a hilly region but your route will lead through the most beautiful areas without defeating you with the climbs! The seaside riding days and views to the African continent are especially rewarding. The sense of accomplishment by riding one of the most scenic tours in Spain is one that will stay with you forever! 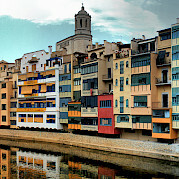 For a list of all of our bike tours in Spain click here. *Other requested dates are available for 2 participants at an additional charge and any group over 4 pax at the normal published price. Subject to hotel availability. Group pick up at Malaga Airport at 4 PM. Bus ride to Casares is approximately 1 hour and 15 minutes. Return transfer to Malaga at approximately 10 AM. Transfers are included in the tour price. Check local conditions prior to departure. Average high/low temperature in °F for Seville is 62/55 for April, 79/55 for May, 90/64 for September, and 68/62 for October. Please keep in mind that although the tour is considered guided, the tour guide does NOT cycle with the group unless there are more than 14 people. In that case, there is a tour guide and a support vehicle driver. Groups range from a minimum participation requirement of 4 to a max of 16 persons. For groups of less than 14 persons, the tour guide acts as the support vehicle driver. He/she ensures that hotel, meals, transport and the riding goes smoothly and acts as your evening host and guide. This person also deals with the general well being of our guests, looks after bicycle maintenance and keeps a close watch on road conditions, route changes, etc. WIFI widely available throughout Spain. Please note: The dates above require a minimum of 4 participants. Additional dates are available on request for groups over 4 at the normal published price. An additional charge applies for groups less than 4 people. This is a mostly moderate supported tour. Daily cycling distances range from approximately 25 to 36 miles per day over varied terrain. There are portions of this tour that are considered difficult! 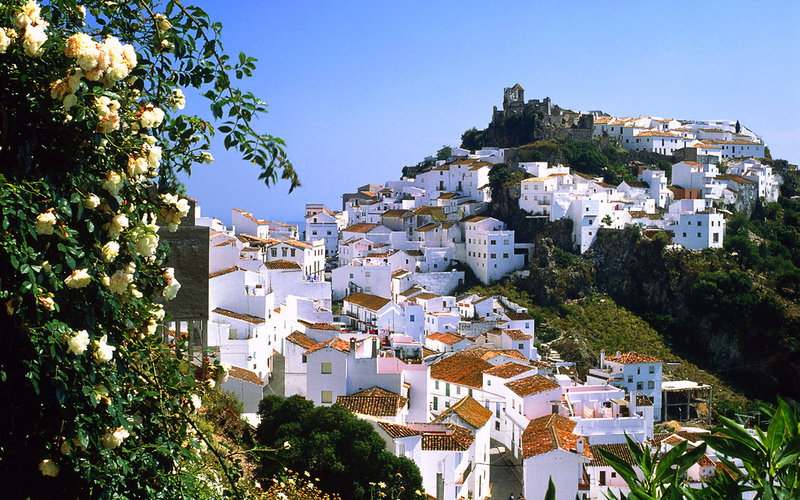 Pick up Malaga Airport / 1 ¼ hour shuttle to your first night in Casares - a beautiful Moorish village steeped in history and charm with fine views to the Mediterranean and Africa. Here, your tour representative will take you on a short city walk through the village’s narrow lanes to the castle followed by a tour briefing and a welcome group dinner. If you are arriving into Malaga by bus or train it is easy to hop on the 20 minute shuttle train to the airport to meet the group and minibus. Please remember that the minibus leaves the airport for Casares at 4:00 pm and will return to the airport around 10:00 am when you are returning home. For your comfort and convenience please keep these times in mind when you are booking your flights. Please note late arrivals will need to make their own way to Casares. This can be done by taxi direct from the airport (around €110). An airport bus option to Marbella from the airport is also available (approximately €7-8), then you can taxi to Casares from here for about €50. If you arrive early to the airport there is plenty to do. You can take either the shuttle bus (frequent), or train (every ½ hour) into Malaga city center (15 min / 1-2 euros max). Here you can visit the Picasso Museum or enjoy a tapas around the Cathedral, rest on the beach or wander up to the Moorish Alcazar Castle for fine views. Alternatively, you can train or bus 20 minutes to the seaside resort of Torremolinos for a beach day, lunch or shopping in this bustling coastal town. Please note – there are NO baggage storage areas at Malaga airport. Bags can be left at either Malaga or Torremolinos bus stations in self-paid, reliable lockers. Overnight Hotel Rural Casares. Dinner included. It is an easy start to your week as you pass through orange and avocado groves of the Guadiaro River then along the winding, tree-lined lanes that border one of the Med’s most important National Parks. Today's route is along easy country lanes in lush surroundings! This afternoon is the opportunity for a free interpretive walk to the Moorish Castle or you can relax around the rooftop pool at the fabulous and historic Hostal Anon, where you will spend the night. Overnight Hostal Anon. Breakfast only. Cycle the charming Jimena to Alcala parkway through the stunning Alcornocales National Park and rolling countryside protected by cork forests and river valleys. Perhaps you'll even catch glimpses of wildlife such as wild boar, deer, and vultures. The route leads on quiet tarmac roads with plenty of scenery en route! Overnight Hotel San Jorge. Breakfast and dinner included. 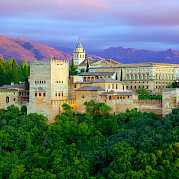 Today's journey rolls through the pretty, open landscapes, vineyards, and traditional bullfighting tierra across open valleys and meadows adorned with wildflowers, natural herbs, cork, almond and olives and a wide array of birds. Nearing the Atlantic coast, you encounter the enchanting medieval center of Vejer de la Frontera, a former Moorish Kingdom set in a stunning cliff top setting with a splendid historic quarter. 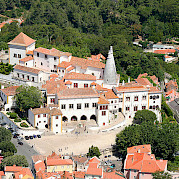 Soon after, arrive in Conil (beachside), for 2 nights in the 4 star Hotel Conil Park. Overnight at Hotel Conil Park (or similar). Breakfast only. Your rest day offers a wide range of experiences. In Conil you can relax and do a little sight seeing, beach strolling, and sample the local tapas and vino. Alternatively, you could visit a sherry bodega, the nearby white village of Vejer or see the famous equestrian show in Jerez (home of Flamenco). The cities of Cadiz and Seville are only short bus ride away if an urban escape is what you desire. Or, if you wish to ride more, there is a lovely self-guided day trip to the beach (approx 16 km each way). Also, for a Bodega (Sherry) tour of Jerez, please let your tour leader know in advance to secure a booking. Osbourne / Gonzalez Byass / Harveys / Sandemans / Domecq and many more. This morning you begin on a charming coastal route following a network of beach roads, pine forests, and lovely parkland through some historic landscapes. Passing Canos de Mecca where Lord Nelson’s navy fleet defeated the French and Spanish in the Battle of Trafalgar and then onto the Pirate backwaters of Barbate where Franco himself regularly vacationed away from the madness of rule in Madrid! Enjoy many opportunities to swim today! Tonight's stay is at the beach side resort of Zahara de las Atunes. 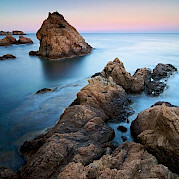 Enjoy an evening Atlantic sunset with views to the African continent. Overnight Hotel Gran Sol (or similar). Breakfast only. 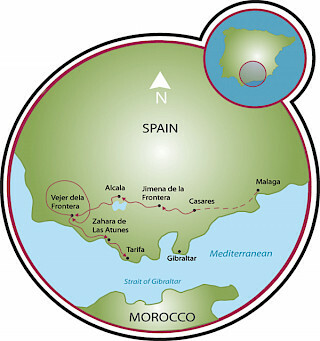 From Zahara, you ride the colorful beach paths and coastal routes to Bolonia where we visit a magnificent Roman site before carrying on through the inspiring landscapes, dunes, and forests leading to Tarifa – the southern most point of Europe and the gateway to Africa. Tarifa is like nowhere else in Europe. It blends Moorish African culture with a thriving adventure tourism industry centered on the surf and wind sports. It is also the main corridor for migratory birds between Africa and Europe and offers insight into flora and fauna that is unique to the entire continent! The vibe here is tremendous and it leaves a very fond impression of Spain – especially in light of the overdeveloped Mediterranean side. Overnight Hotel Alameda. Breakfast and Dinner included. Breakfast is included today before departure for the guided tour depending on departure time and availability. Return morning shuttle to Malaga Airport. Departure for the airport is usually around 8:00 a.m. for the 2 hour shuttle. 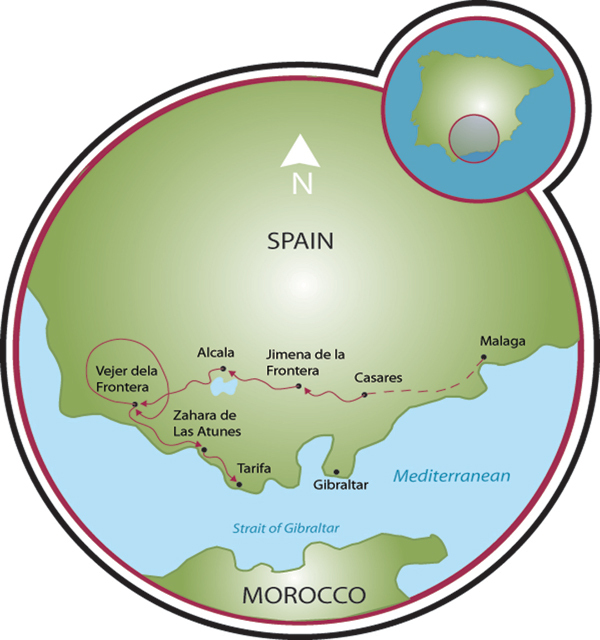 For those wishing to travel onto Seville or other destinations in Spain, Tarifa (and Algeciras) offer very good transport hubs. Please note - Itinerary is subject to slight changes and/or direction of travel but quality will not be effected. Our guid Jeff Lacey was outstanding and and certainly added to the enjoyment of the trip which was very well organized. The scenery was awesome and the whole trip was fantastically organized and Jeff Lacey our guide was tremendous. We would recommend this trip to all our friends and will in all probability do another one in a year or two.